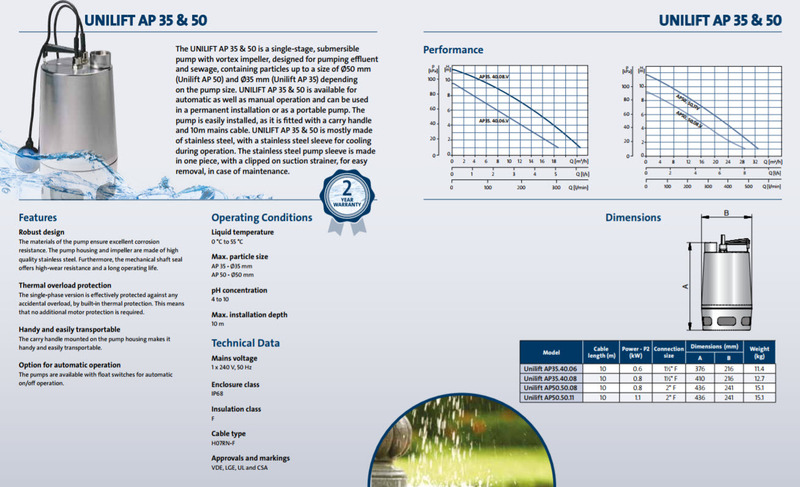 The Grundfos Unilift AP 35 & 50 Sumersible Pumps are suited for temporary and permanent installations. While being single-stage pumps they are also available in different phases and power supply. Available in either Single phase or Three phase. All Unilift AP pumps are equipped with a plug to connect to mains power. With a vortex impeller the Unilift also allows you the option of a float switch. Whether it's for automatic or manual operation, choose the float switch supply you desire. 3-phase versions include a starter box connected to the float switch while single-phase versions have an inbuilt thermal switch. Mostly made of stainless steel, the pump also contains a stainless steel sleeve designed for cooling when in use. Particle size which the pump can handle depends on the size of pump selected. AP 35 can handle particle sizes up to 35mm while AP 50 can handle sizes up to 50mm. Outlet connection is located at the top of the pump. Reliable and simple to install – let the Grundfos Unilift Submersible pump assist you in your next project.